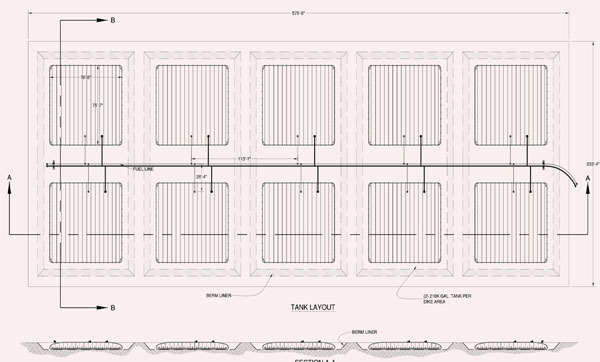 For capacity or multi-tank fuel storage, pillow fuel tanks can be placed in a fuel farm layout to create an economical and reliable bulk liquid storage area. Built from top quality, tough and durable materials, these tanks have been used to store fuel for mining applications, gas industries, farming and agricultural areas, aviation vehicles, and more. The fuel bladder, is a flexible, quick deployment tank that has been used to store a wide range of liquids including diesel fuel, process water, brine water, and more. Typical capacities for the fuel bladders have included 25,000 gallons, 50,000 gallons, 100,000 gallons and even 200,000 gallon options. The largest available tank is the 210,000 gallon bulk storage unit. Due to the large capacity and demanding nature of these tanks, all fuel bladders are constructed from a heavy and robust fabric that is equipped to handle the nature of fuels as well as many outdoor elements. Material options have included fabrics for both extreme hot or cold climates. Flexible Fuel Farm Tanks are made from rugged materials that make them well equipped to handle fuel, chemicals, oil, as well as outdoor conditions. As an alternative to steel, these flexible tanks can be set up faster while still providing you with quality fuel farm or fuel storage needs. When using these large fuel storage tanks in a fuel tank design (such as in the example below), tanks can be quickly installed around fuel lines or in other areas for fast storage. The table below shows typical specifications for one of our largest collapsible tanks. These units are also available with capacities anywhere from 25 gallons to 210,000 gallons. 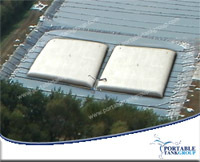 For further support, berm liners can be placed under these tanks for extra ground protection. Quick to Install: Tanks are easy to set up and deploy quickly to your site. Cost-Effective Shipping: Collapsible tanks can be rolled up when not in use and shipped to you in bulk quantities. High Temperature Resistance: These fuel storage tanks are built with materials that hold up to both cold and hot temperatures. High or Low Profile: Tanks are made to meet your needs. Portable Tanks, a division of GEI Works is committed to helping you find solutions to your liquid storage needs. Please don't hesitate to give a call and discuss your specific location requirements or fuel farm designs. These large capacity tanks have also been used for bulk liquid storage projects including the storage of gray water, black water, brine water, and drinking water. For more information, check out our Collapsible Pillow Tank product variety.